How to Apply online at scholarship.up.nic.in for UP Scholarship 2019 - Hello Everyone , today we are going to share complete information about how to register online at scholarship.up.nic.in for UP Scholarship 2019 . For Complete Process Read This Full Article. Now click on the 'Student' link on the Home screen and click on 'New Registration' from the list. After clicking, a new page will open in front of you. When you register for UP Scholarship 2019, you pay attention when you are registering, according to your category, as shown in the above page, the selection of the Social Welfare Department is to be According to Category. Suppose if your category is SC (Scheduled Caste) then you have to choose 'Social Welfare Department Uttar Pradesh (for SC, ST, General category)', after this, if you apply for scholarships in the first year of the course So you have to do fresh registrations. If you are applying for the second, third, fourth year of the course, then you do not have to do new registration, but only the renewal of old year registration will have to be renewed. While applying online for scholarships, there are no false information in the online application form. 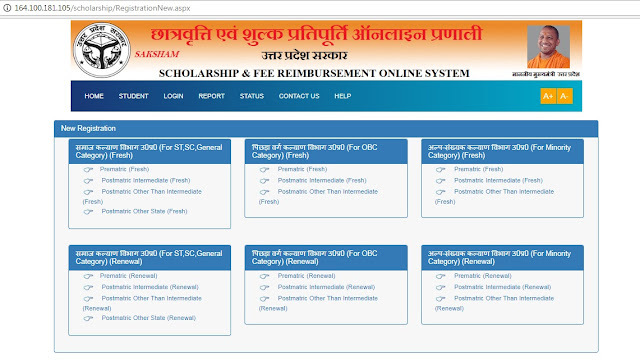 In the case of the last year's examination, you are not eligible for scholarship, do not apply in such condition. All your certificates should be correct, they should not have any kind of error. When your online registration is complete, its final print will not be printed. Before Printing the final print, you have to get 'Print to check' so that you can check that any information in the form is incorrect. If any Details are found to be incorrect, then you can revise it again. If you have printed the final and your form gets a few mistakes, then you will not be able to revise it. So check the form thoroughly before printing the final Print or you can check the form in your school / college too. ➤ Official Guidelines for Filling UP 'UP Scholarship Form 2019' - Click Here. You can print finalized after checking the application form. After taking the Final Prints, you will now be able to attach the photocopy of all your documents such as last year's examination, income certificate, caste certificate, original residence certificate, Aadhar card, bank account slip, etc. Create two or three sets and submit to your school / college.